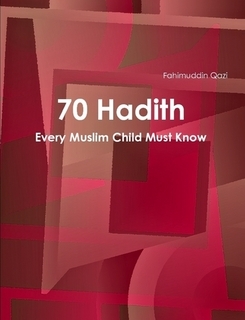 Why 70 Hadith For Children? 1) Build character, iman, and Islamic morality. 3) Avoid sophisticated theological and legal topics that are appropriate for adults, specialists, students of Islam, or Islamic scholars. 5) Enrich the Islamic studies curriculum at Islamic schools and homeschools. 6) Make it easy enough so that an everyday Muslim parent with basic Islamic education can teach it to their kids. 7) Keep the translation short and simple, and provide brief explanatory comments via footnotes.